I am a police detective with the San Antonio (Texas) Police Department. We have a “SanAntonio110″ group that climbs our Tower of Americas in downtown SA every anniversary of 09-11. This group is comprised of SA Fire, SA Police, and a whole host of regional departments that pay tribute and honor our Brothers who stepped-up and braved the horrors of 09-11-01. Additionally, numerous civilians are invited to join in the climb. A lanyard, with the picture of our respective New York Brother, is given to carry as we ascend the Tower…twice (110 floors). 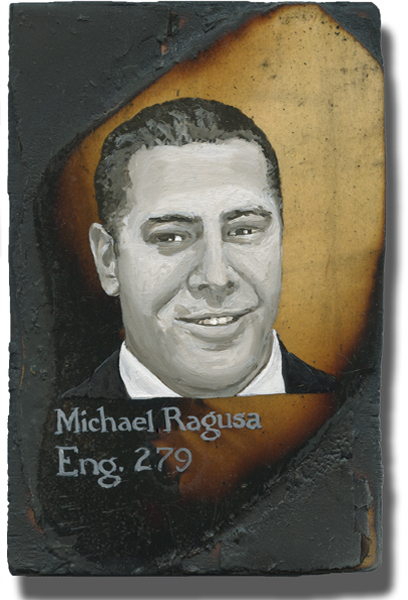 I was honored this year to carry Brother Ragusa’s picture with me for the climb. At the end I was tasked with placing a nametag with his name on it on a wall board and signaling his call home by ringing the “fire” bell. If anyone is able to contact his family members, I would be more than happy to send them the pictured-lanyard and any other photographs from the event. May God watch over you all!